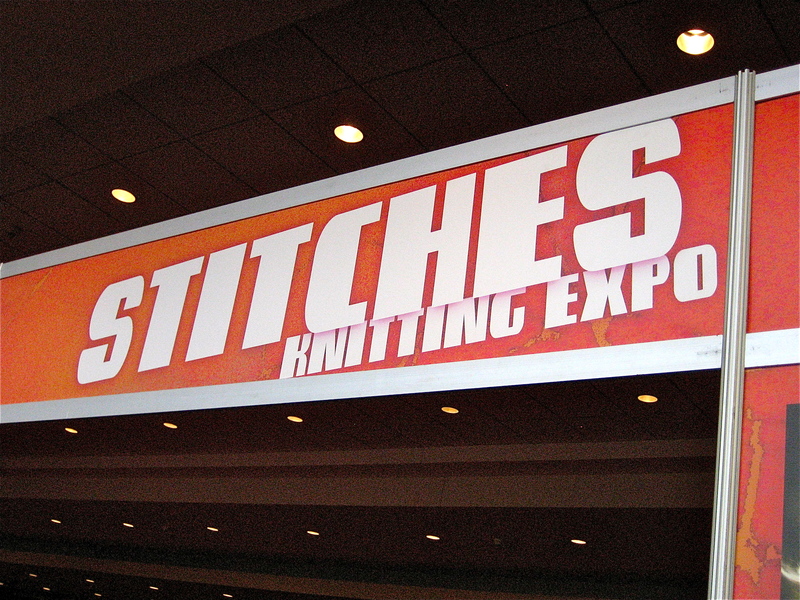 I was totally looking forward to attending the Stitches East Knitting Expo at the Connecticut Convention Center last Saturday, and I was thrilled to be there! Aisle after aisle of vendors with booths chock full of yarns, patterns, books and hand-knit samples. The hottest, trendiest hand-knitted garment? Hands down, the shawl. 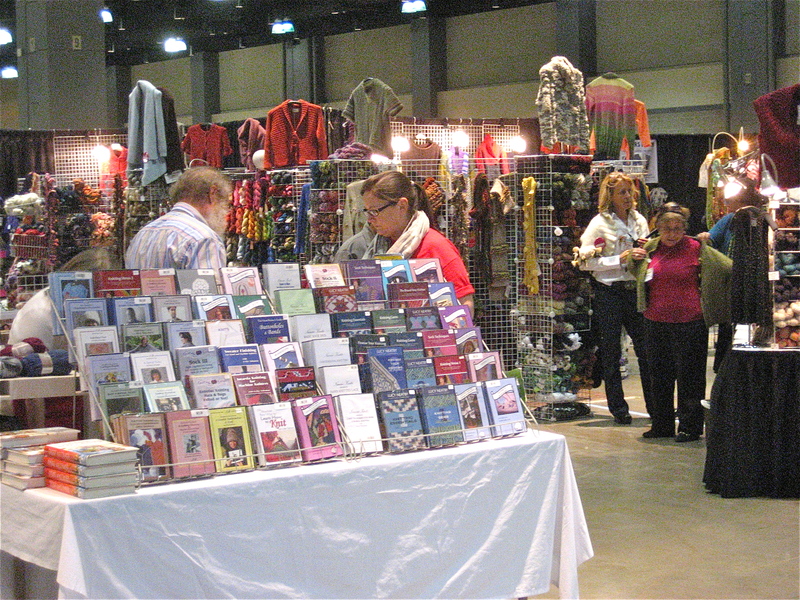 Almost every vendor offered a custom pattern, kit, and sparkling sample of the most beautiful shawls…some that just barely covered the shoulders and others that cascaded to the waist. And, for a sparkle-loving girl like me, I was thrilled to see that so many of them were knitted with yarns that glistened with tiny sequins and bright, shiny threads! Sweeeeeeet. Lots of hand-dyed yarns and sock yarns, too! I was hoping to come away with bags full of yarn and glowing holiday inspiration, but it didn’t happen. I can’t explain it really. The vendors were very friendly and not-at-all overbearing, but I wasn’t overcome with feelings of “OMG….got to buy that NOW….gonna make a ton of these” (my typical M.O.). I bought a kit which contained a gift tag and the pattern, yarn, and hook to make a crocheted teddy bear. 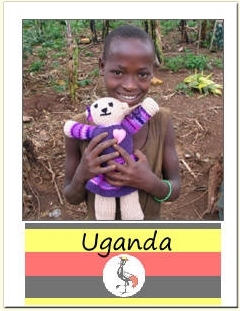 I encourage all of you who knit or crochet to visit the website, purchase the pattern, and get started making the gift that warms the hearts of these beautiful children. Mine is underway and I’ll post it here as soon as it’s done. I think it’s going to be the one on-going project that seriously reduces my stash and gives me the opportunity to make some unique little teddies for a movingly worthwhile cause. This may not have been the gift-giving holiday inspiration that I was seeking, but it touches my heart and warms my soul in a way that no other project can. I think Suze Orman has had her effect on many of us. Maybe a little sparkle on the ruffle of the bear’s skirt…and a matching shawl??? PS I’m not trashing Suze… I’m just learning I don’t have to OWN everything I see and love. Hmmm…let’s see if the “Suze Orman Effect” rears it’s head at WEBS next weekend. That Mother Bear project sounds amazing. Heading to the website now to check it out! What a wonderful project! Sounds just like you. Warmed the cockles of my heart.Happy knitting! N.Y. in mid October and just last weekend there was the first Fiber Festival of New England in Springfield, MA. We took a few classes this year at Stitches. We’d love to go to Vogue Knitting Live in January, but just for the shopping as the weather will definitely be a factor. I gave Linda some websites for you to check out, but here’s another one -purlbee.com. You need to check out their blog as lots of cool knitting, crochet, sewing, and craft projects. Linda has told me about your many talents and I’m so glad that you took the time to check us out! This was my first visit to “Stitches” and I was sorry to have missed Rhinebeck. I had no idea of its popularity until I saw it on Ravelry, (if you’re on Ravelry, I’d love to see your projects!! I’m registered as MissAnnie), but you can bet I’ll be there next year! Vogue Knitting Live also sounds very enticing. I’d love to hear of any new sites or projects that you’d like to share…keep me posted!